If you are involved in shipping rental equipment or require customers to send back a core product when the new part arrives, we may have a fantastic solution for you. Switching to a shipping case with a lifetime warranty can not only save money, but it can make a huge impact on number of damaged goods. It can also make your organization a little more green. * Parts are more likely to arrive safely. * Parts are more likely to make it back, because the box is still usable, properly labeled, and significant: the shipping container no longer gets tossed. The ROI has been significant and almost immediate. When the rental period is over, and the equipment needs to be returned, is the original packaging still available? Or will it be returned in a mis-sized cardboard box stuffed with newspapers? A quality shipping case might add a bit to the initial project cost, but damaged equipment costs are huge! Again, the shipping case is always saved, always properly labeled, and always custom designed for ultimate protection. Our customers at Kansas State University ship computer stations all over the country, in conjunction with 4H members. It is a great program that allows rural kids easy access to communicate with military parents deployed abroad. Since switching to reusable shipping cases, they have not lost any equipment from mispacking or shipping damage. Plastic or Paper? It is not every day that a company selling plastic boxes gets to brag about being green, but in this case the math works out, and works out well. Multi-use packaging trumps single-use packaging every time, even when the cardboard is recycled (keep in mind there is a bunch of Styrofoam in single use packaging too!). Pelican has done studies showing that the number of times a case needs to be used before it is the environmentally better choice is amazingly small. 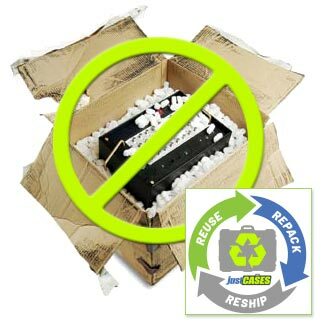 At justCASES we offer custom-cut foam and a wide variety of ready-made cases for your reverse logistics needs. Using a ready-made case offers price savings, plus choosing a Pelican or SKB model gets you a lifetime warranty. If this sounds like an opportunity for your company to save some money, get a little greener, and make sure your parts and equipment are being shipped in the safest possible manner, all you need to do is give us a call at 888-318-5878.